For the CIAO 4.11 / CalDB 4.8.2 release notes see How CalDB 4.8.2 Affects Your Analysis. The September 2018 adjustment to the HRC-I time-dependent gain map has been calibrated and has been released. The rate of gain decay continues to increase with time; however the HRC calibration team has determined that an annual GMAP adjustment is adequate to maintain approximately 2-4% global accuracy in the gain. 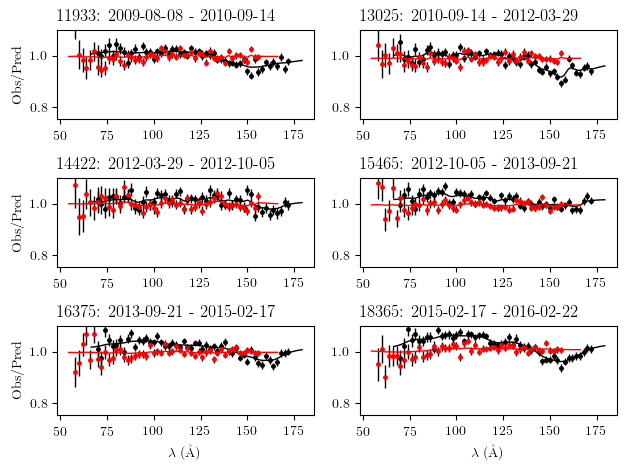 The a new compilation of the same prescribed set of ArLac observations has been used to measure the gain corrections. Details including a plot of the new GMAP and its differences with the previous corrections for 2017 are included in the technical details section below. As with previous HRC-I GMAP updates, these changes will apply only to recent HRC-I observations, specifically those with DATE-OBS later than 2018-09-17T12:00:00 UTC. Along with the new 2017 HRC-I GMAP, the incumbent PIBGSPEC for September 2018 is also being released. 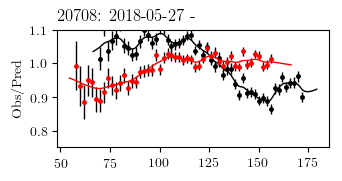 The PI background spectrum changes with the GMAP, because background events reprocessed using the new GMAP, using the point-source observations as are used to generate the new GMAP. This results in a shift in the background spectrum in channel space relative to the previous spectrum file. Details of how the derivation is done, and a plot of the new spectrum in comparison with previous PIBGSPEC files are given in the technical details section below. As the LETGS calibration team has monitored the accelerated rate of decay in the HRC-S quantum efficiency as a function of wavelength, they have elected to replace the current set of time dependent QE Uniformity (QEU) files (version N0009) with another new set of files, version N0010. One additional file has been added to the set, with new effective date of 2018-05-20T00:00:00, so that the set includes 24 files now. See the technical details section below for illustrations and details of the derivation of these new QE Uniformity corrections. In general, this latest set accounts for an additional 2.5% of QE loss over the 0.060 - 0.652 keV range; above that range, the change is minimal. See also the why page for more general information on the HRC-S QE/QEU corrections in the CalDB. The HRC-I GMAP (sampgain) file named above has an incorrect CVSD0001 keyword value, which causes it to become effective earlier than it should be, but because of the justapostion of previously released HRC-I GMAP files in CalDB, results in the file only being selected when it should be after all. Hence, the change being made here has zero effect on GMAP file selection for any HRC-I OBS_ID; however we are correcting it just in case a future change to an earlier GMAP file will not result in new selection issues that are not currently occurring. The calibration validity start date of the above file has been originally set at (UTC) 2012-09-27T12:00:00 instead of the correct value of 2015-09-27T12:00:00. With the CalDB 4.8.2 release, this value will be set to the correct value in the named file. The CalDB Manager has verified the named file has been being selected and applied in reprocessing with either the CIAO tool chandra_repro, as well as in the DS software that is used for scheduled archival reprocessing, despite the header error. More details are given in the technical details below, but in general users may ignore this information and proceed with any HRC-I observation reprocessing without concern for this change. The new HRC-I GMAP generated for the (UTC) period 2018-09-17T12:00 to the present, and extending into 2019 is shown in Figure 1a below, with the ratio of the new map to the 2017 map given in Fig 1b. The corrections were generated using G21.5-0.9 and HZ 43 calibration observations taken regularly to monitor HRC-I, combined with a sequence of ArLac observations at 21 specific locations on HRC-I, taken annually. The procedure used to derive the updated GMAPs is given in the publicly-posted document ""SUMAMPS-based Gain Maps for HRC-I", and will not be pressented in detail here. Fig. 1a: The new 2018 GMAP image derived from ArLac observations at various locations on HRC-I taken during September 2018. Fig. 1b: The ratio of the new 2018 GMAP to the old 2017 GMAP. Near the center, the change is +5% to +6%; The red region indicates a change of +10%. A corresponding upgrade to the PIBGSPEC library for 2018 has also been derived, effective for the same time-period as the above HRC-I GMAP. The background PI spectra are generated from the same HRC-I calibration observations of AR Lac used to derive the new GMAP. These 21 observations are reprocessed with the new GMAP, generating new PI scaled to SUMAMPS values. The result is illustrated in Fig. 2 below, with the red trace giving the new 2017 bacground spectrum, the bold blue trace is from the 2016 data set, and previous years in various line types for comparison. Fig. 2: Taken from the Chandra Cycle 21 POG, the red trace is data from the new PIGBSPEC file for 17 September 2018. The bold blue trace just beneath the red one is from the 17 September 2017 file. 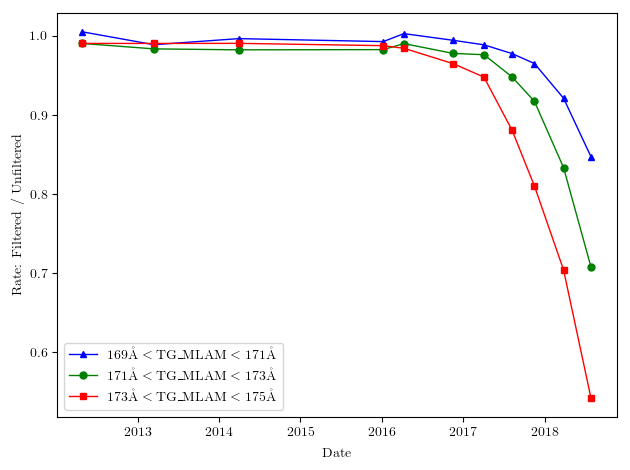 "Since roughly the beginning of 2017, due to evolution of the HRC-S gain, (tg_lam,pi) background filtering has been rejecting an increasing proportion of valid longest-wavelength positive order events. Gain and PI filter recalibration are priorities and will be revisited soon. Meanwhile, until now the QEU has been calibrated to such filtered spectra, but beginning with the N0010 release, unfiltered spectra will be used instead. "This HRC-S QEU N0010 update incorporates the latest HZ 43 LETG calibration observations into the analysis. Using these most recent data, the post HV-change (2012-04 and later) wavelength-independent linear QE decline has been revised from 2.49%/yr to 2.51%/yr for 0th order, and from 2.27%/yr to 2.34%/yr for dispersed orders. The figures below also show what additional empirical wavelength-dependent dispersed order corrections are required to match the HZ 43 fiducial WD model." Fig. 3: Ratio vs time of (tg_lam,pi)-filtered specra net counts divided by unfiltered spectra net counts, in positive order longest-wavelength bins, from HZ 43 HRC-S/LETG calibration observations. Fig. 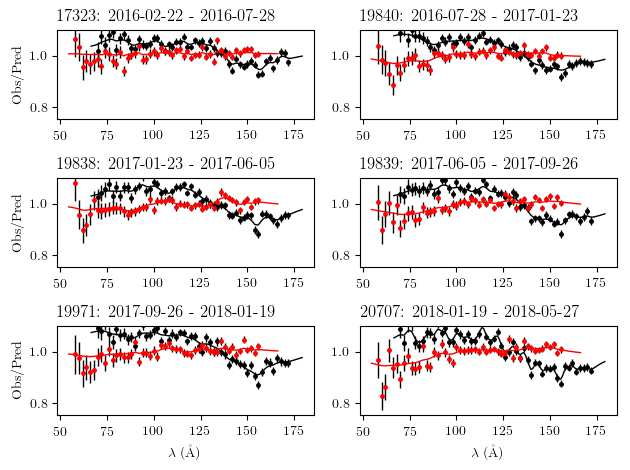 4: The residual wavelength-dependent continuous autoregressive moving average model correction for each epoch's QEU CalDB file, after the linear temporal wavelength-independent QE decline has been applied. Red curves are negative dispersed orders, black are positive orders. An error has been discovered in the file header of the HRC-I GMAP (aka "sampgain") file effective 2015-09-27T12:00:00 until 2016-09-20T00:00:00. The file's name is hrciD2015-09-27sampgainN0001.fits, and the error is that the Calibration Validity Start Date (CVSD0001) keyword is set incorrectly to 2012-09-27T12:00:00, rather than the proper value of 2015-09-27T12:00:00. While this error might have had consequences that the wrong GMAP file would be selected in reprocessing of some 2012-2013 HRC-I observations, this is not indeed the case. We have checked the archive for HRC-I observations covering the period 2012-09-27T12:00:00 through 2013-09-16T12:00:00, and found that all 30 such observations have been processed with the proper hrciD2012-09-27sampgainN0001.fits file. Furthermore, we have checked the archive for HRC-I observations over the period 2015-09-27T12:00:00 through 2016-09-20T00:00:00, and found those 14 OBS_IDs to have been properly processed with hrciD2015-09-27sampgainN0001.fits. The Chandra CalDB Manager has also reprocessed all 44 of the above archival OBS_IDs, using CalDB 4.8.1, and they each selected the appropriate HRC-I GMAP file for the reprocessing, despite the error in the CVSD0001 value indicated above. Hence, there is currently no problem for users. The reason the error has had no effect is because of the juxtaposition of Calibration START and END Dates in the previous GMAP files in CalDB. Notwithstanding, we have decided to correct the header error anyway in CalDB 4.8.2, to prevent any accidents or instabilities the error might cause in the future CalDB builds. Hence, users should not be concerned with this change; it is only being done purposes of propriety and clarity in CalDB management.